Thermal Infrared Imaging has been used by military and top companies for decades as a tool to see what we normally can not, and prevent costly repairs down the road. So why would'nt you do the same during your home inspection. 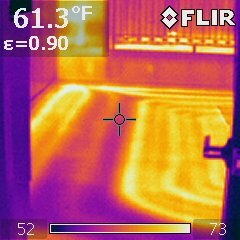 By utilizing temperature differences, the camera is able to show variations that, when observed properly, show things like overheated electrical components and lines, leaks and water damage behind walls, as well as, energy deficiencies such as missing insulation, drafty windows and doors and insulation problems in the attic. 7 County Home Inspection is one of very few local home inspectors to offer the technology of infrared to help diagnose concerns and uncover deliberately hidden problems. WHY HAVE AN INFERIOR INSPECTION? you want to know as much about the home you are purchasing as you can. Do not spend hundreds of thousands on a home and save a few dollars on an inferior inspection, only to find out that there is a water leak that went undetected after you move in. BE SURE THE INSPECTOR USING THE THERMAL INFRARED CAMERA IS CERTIFIED!